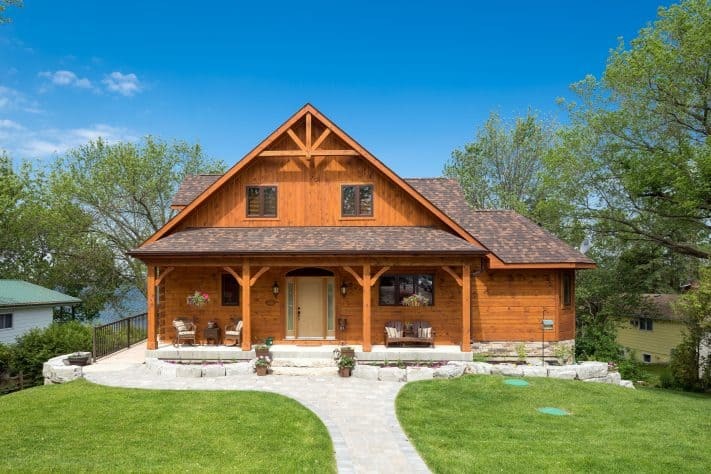 In the face of personal tragedy, one couple’s creates a custom log home that speaks to the soul. Depending on Mother Nature’s mood, the weather on Lake Scugog—a natural gem in the Kawartha Lakes region of Ontario—can be surprisingly turbulent. Winds blow at gale force, sweeping the rain sideways. Michael Lamers’ and Cheryl Higgs’ log home stands sentinel over it all. When the storm subsides, the waters seem particularly peaceful, by contrast. And, it’s fitting really—this calm following the storm—because, for the couple, that’s exactly what this home is: a return to calm, a respite after the storms. For years, this beautiful stretch of land was home to some of Michaels’ fondest memories. 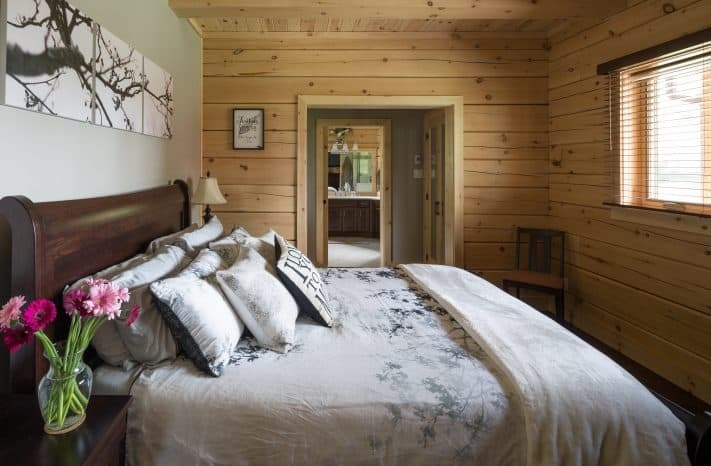 He first began visiting as a boy when his family purchased a cottage on the lake where they spent summers boating, fishing and enjoying long, lazy laid-back days. Michael often returned to those memories while spending the next few decades living in the city. Finally, he and Cheryl decided to take the plunge back into lake life. 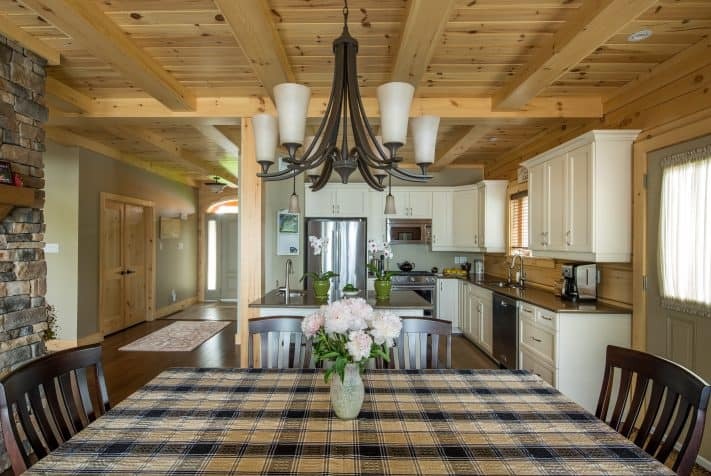 The current cottage wasn’t suited to year-round living, so they planned to raze the original cottage and build a place they could live full-time. They wanted a forever house that would allow them to age in place and had ample room and privacy for Mike’s aging parents to live in from the start. They signed on with a company specializing in pre-fab builds, and in the beginning, all was well. Suddenly, communication ceased. “They were stalling; they wouldn’t answer emails,” Cheryl explained. “Then, we found out they went bankrupt. From there, “everything went crazy,” Cheryl recalls. Because the company was filing bankruptcy, their funds were in legal limbo. But finances were far from the hardest part of that season. During this time, the couple lost their son in a car accident overseas. Shortly after, Mike’s mother was diagnosed with cancer and his father with Alzheimer’s. So, as life’s storms raged, Cheryl went to her computer and googled ‘custom home builders in Kawartha Lakes.’ Confederation came up. 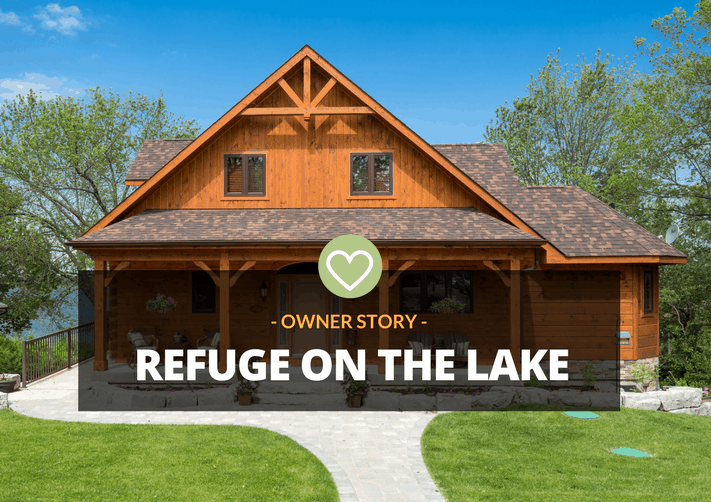 After some research, the couple realized the Bobcaygeon plan checked all of their boxes: an open concept living area, master en-suite on the main, a grand double-sided fireplace and an in-law suite in the walk-out basement. While meeting with the design team, they made a few adjustments—flipping the position of the kitchen and dining room and adding a home office upstairs. “Confederation took the time to listen and make it right for us,” Cheryl says. The building process was seamless, and the couple moved in the following summer.